I had the chance to visit Spain recently, to take part in an event with Spanish worker co-operatives under the auspices of the national network and Co-operatives Europe. The Spanish co-operative sector has always been vibrant and colourful, but the way in which it has stepped up in the aftermath of economic crisis and the credit crunch is instructive and inspiring. 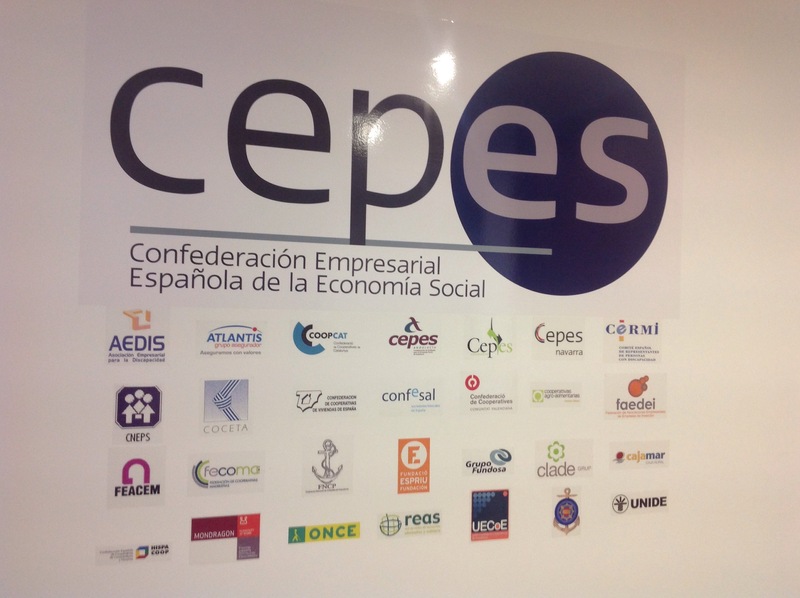 The organisation CEPES is the voice for the social economy at a national level, giving the social economy a far higher profile in government economic and business decision making. It is what in the UK we have been tiptoeing towards, in the form of our successful Social Economy Alliance. The true power of the social economy combined is economic as much as it is policy and political. The Spanish social economy covers 44,563 businesses with a turnover of 151 million euros, employing (directly and indirectly) 2,215,000 people and linking up 16,528,000 people as members. For me, the Spanish movement teaches us that there is always one more way you can co-operate, one more step you can take, one more way in which you can be great. 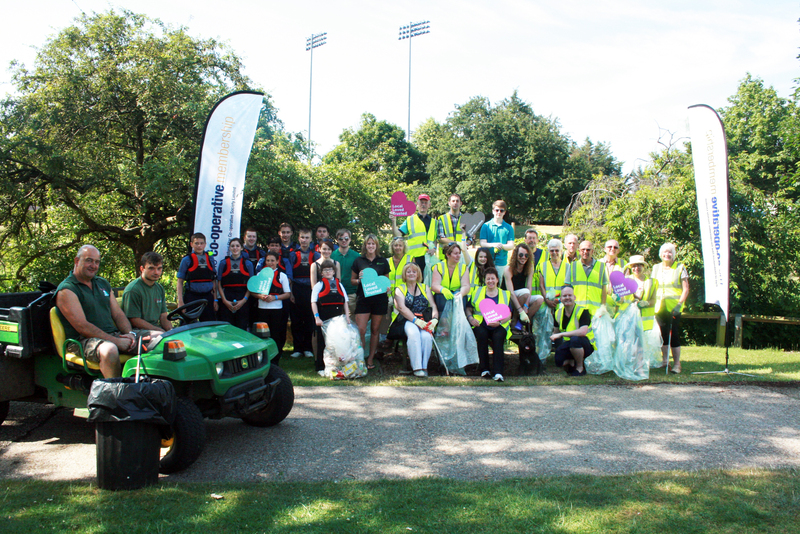 Over the last few weeks, co-operatives across the country came together to clean up local streets, parks and waterways as part of this year’s Co-operatives Fortnight. Themed the ‘Big Co-op Clean’, Co-operatives Fortnight is a national campaign, and clean-ups were organised from Ipswich to Inverness, with co-operative retailers, pubs and housing providers all taking part. With our members, Co-operatives UK organises Co-operatives Fortnight each year, focusing this year on demonstrating how co-operatives make a difference locally. Our Big Co-op Clean came on the back of new survey results we commissioned, showing that one in three people (31%) report that litter on the streets has increased, compared to this time last year. Summer is when litter is most visible and the trends are on the increase, with a 20% hike in fast food waste compared to last year. The state of our streets reflect the state of society – if we don’t co-operate by not littering or value the work of street cleaners who clear up litter, ‘austerity Britain’ risks becoming ‘dirty Britain’. We need collective action, both by the state and at a community and workplace level. Co-operatives are organisations owned and run together by us all, so it’s no surprise perhaps that co-ops are part of the story in working in their local areas to tidy up nearby streets and areas. – In Chelmsford, the local co-operative society organised a clean-up of Central Park, with 50 volunteers collecting over 100 bags of rubbish. – In Hebden Bridge a local co-op pub cleaned up the woods, finishing with a well-deserved co-operative pint. – In Manchester, a local worker owned retailer organised a clean-up of the local cycleway, providing helpers with soup along the way. – In Scotland, the local co-operative organised for members to tidy and paint the playground in Coupar Angus, which was representing Scotland in the Britain in Bloom competition. The Big Co-op Clean has not just been part of a fabulous fortnight, but helped to show how co-ops make a difference in their local communities, day-in, day-out. Nowhere is the power of business to achieve change more emblematic or more hopeful than the sunrise of the community energy sector across the UK. It has been an extraordinary journey to see new technologies for a clean future matched by new techniques for community organising, offering a very human scale domestic success story. Ever since the first renewable energy co-operative, Baywind, started, the sector has been an exemplar for bootstrap learning and peer support. The backing of Esmee Fairbairn and the partnership we have had with Locality and the UK Government for our Community Shares Unit, focusing on local equity raising, has allowed us to experiment in how to build on this, with a practical project backing the energy and potential of peer support. Every success story has many people that can claim to have had a share. But the practitioners are the ones that know how narrow the difference is between success and failure, and own the insights and experience that make the difference. So much advice and guidance in social enterprise and wider business settings tends to be provided by intermediaries without that hands-on experience – they can add value, but what practitioners can add is often invaluable. Or tends to offer pages on a website, when what is needed, at the early stage, is conversations with people. Community energy comes in many different legal and organisational forms, but there is a natural co-operation across them all. Community energy pioneers and practitioners are often the most generous of people with their time and expertise. But again, it is all too common for this to be taken for granted. They are typically running enterprises that need their focus. Again, across the wider social enterprise and business sector, there is often an assumption that such people will volunteer to be mentors, to ‘give back’ when they have already given so much. What is unusual about this project is that we have tried a methodology for business development that, as an alternative to the costs of traditional sources of business support, creates a modest but enabling reward structure for practitioners to be able to support those who are following them. The idea for the work came from conversations with our members, in work completed by Becky and Jenny Willis who have made a huge contribution to our work at Co-operatives UK over time, to support the fledgling community energy sector. Of course, some of the barriers that practitioners have faced are better simply removed, rather than advised on. Community energy is influenced by a complex policy and regulatory environment and there are lessons, and recommendations, for national policy that we draw from our work in this project that are set out in our Policy Report. The challenge of creating a sustainable economy is sometimes characterised as about learning to adapt to the future we face. The challenge of scaling community energy, across all the relevant renewable technologies, is also about learning. How do we accelerate learning, in order to accelerate practice? One answer which can now be added into the mix is energy mentoring. The challenge of creating a sustainable economy is sometimes characterised as about learning to adapt to the future we face. The challenge of scaling community energy, across all the relevant renewable technologies, is also about learning. How do we accelerate learning, in order to accelerate practice? One answer which can now be added into the mix is peer to peer mentoring. Could the future for business advice be a co-operative one, based on a far greater degree of peer to peer mentoring? We have put together Our Impact Report on what we have learned through the project. We would be keen and interested to share ideas on the approach and to engage with partners and in new partnerships to make the most of peer to peer models of advice, both for community energy and indeed for wider social and economic innovation. There is a longstanding tradition of alternative economic strategies in the UK. Many have been at the macro policy level. I have written a few myself in my former time as Director of the New Economics Foundation. They are important as beacons, lighthouses for a different set of policy prescriptions. But the most important perhaps have been those that have emerged out of practice, and inspired practice in its turn, because they have the chance to be embedded and owned by social movements… the Lucas Aerospace Plan led by Mike Cooley, which inspired a generation of work around technology exchange; the work of the Greater London Enterprise Board (GLEB), with its long term venture funding; or the Highlands and Islands Enterprise Board, backing community economic development. 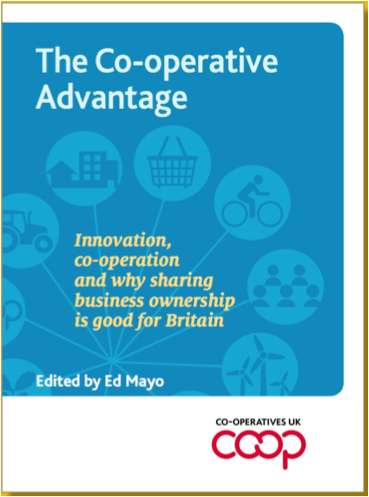 Co-operative Advantage is a book in this space and tradition. New out, it is based on research I have led over three years with co-operative business experts, advised by Professor Michael Best, University of Massachusetts Lowell, an internationally recognised authority on sector development. Michael was part of the GLEB story, along with Robin Murray, who has been an inspiration for the work and contributes one of the closing chapters. The research for the book analyses growth sectors around which the co-operative model has an edge and a fit that offers a competitive advantage – identifying fifty potential innovations that dovetail with emerging trends in technology and markets. The total economic value of the sectors that we look at add up to 61% of overall GDP and account for 64% of total employment in the UK. The authors of the fifteen sectors are co-operative entrepreneurs or business analysts with expertise in the area, and each has been the result of extensive engagement with coops and mutuals in each sector, representing a bootstrapping of knowledge. The model of sector development is one that has a long history in economic policy making. A sector strategy in conventional economic development is a term that describes a process for stimulating the absolute growth of an industrial sector or sub sector. his would require a blend of demand and supply side measures, such as: sheltered or supported markets; active marketing; dedicated finance; infrastructure; workforce development; business networks; research and development, including links to academic institutions etc. Often these would stem from public policy decisions and be supported by the state. A sector strategy, though, is also about enabling existing enterprises to understand the trends that are shaping the markets that they operate in. The starting point is the political economy of innovation. Innovation is estimated to account for 70% of long-term economic growth. But whose innovation and in whose interests? Innovation is endlessly talked, always assumed to require venture capital to drive it, corporate patents to protect it, but the political economy of innovation is less often subject to scrutiny. I see innovation as social change. Yes, there are drivers for innovation that we look at in each sector, in technology, culture, demographics and environment, but we are looking for the innovations that can be accelerated for social and ecological gain. We need placards, yes, but we also need a social economy.